Continuous ribbon switch packaged in 50 ft rolls. This product is unterminated and requires one or more of the bulk switch accessories to make it functional and to mount it. 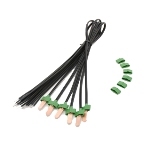 Accessories for bulk ribbon switch include terminal sets, "L" and "T" connectors, mounting channel, and mounting tape.